I visited The Legacy Museum, if not the first week, then the second week that it opened. 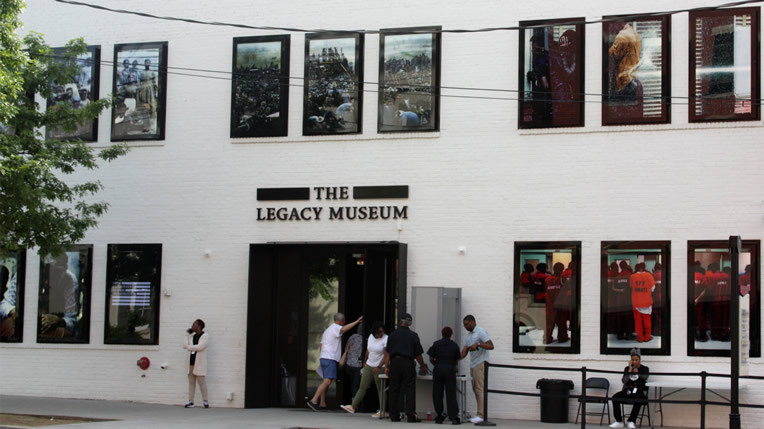 The Legacy Museum was created by the Equal Justice Initiative and is located in Montgomery, Alabama. It’s a few blocks away from The National Memorial for Peace and Justice about a 15-minute or so walk and obviously a shorter distance driving. The National Memorial for Peace and Justice is located about a 15-minute walk away from the Legacy Museum. It’s really pretty from the outside with beautifully landscaped plant beds and a brown wood fence surrounding the Memorial. I’d read about lynchings before in books about Ida B. Wells and At the Hands of Persons Unknown. But it was something different to walk through the National Memorial for Peace and Justice and crane your neck to look at all of these blocks knowing that each one of them represented the loss of at least one person’s life. It’s important to note that this isn’t a memorial to lynching but rather a memorial to those who lost their lives to lynching. So the focus is on those who lost their lives rather than those who participated in lynchings. I recently took a day trip to Birmingham as part of my goal to visit as many Southern cities as possible while living in Atlanta. I was attracted to visiting the city by its role in the history of the Civil Rights Movement and also the Birmingham Civil Rights Institute. The Birmingham Civil Rights Institute was founded in 1992 and is located in Birmingham’s historic Civil Rights District.